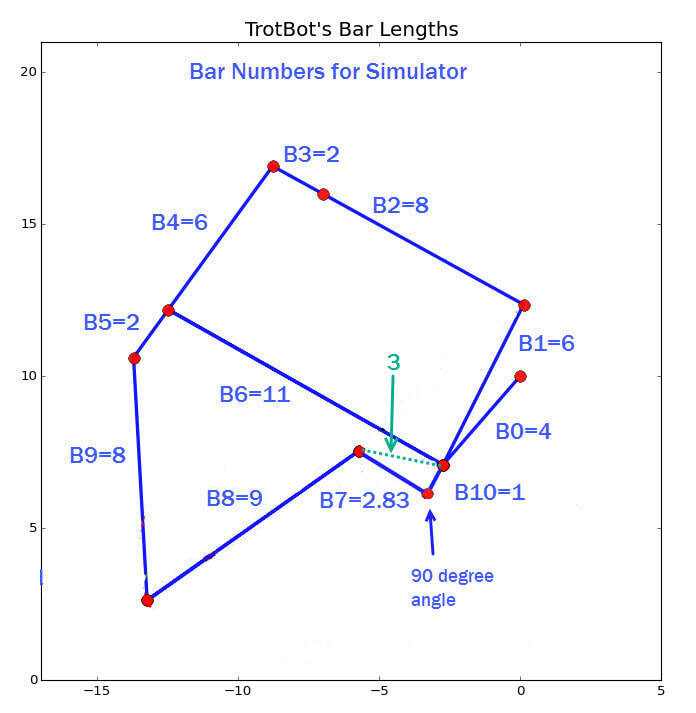 This simulator allows you to quickly check how changing TrotBot's bar lengths affect its foot-path, but remember, just because something looks good in a simulation doesn't necessarily mean it will work well when built - at least not without some tinkering, such as managing possible dead points. You can see an obvious dead point in the "TrotBot Optimizer" video's 3rd configuration (the video on the left). TrotBot's heel and toe linkage dimensions can be found here, along with a summary of TrotBot's development. ​Below are the embedded simulators. You can also run the simulators on MIT's site where you can access and modify the Scratch code. Note: the "HiFrameX" and "HiFrameY" variables are the horizontal and vertical distances from the frame connection to the center of the crank. For efficient gaits, TrotBot's without "heels" should probably be built with 12 legs so that at least one foot is in contact with the ground at each corner of the robot. To see why, notice when TrotBot's heels are removed in this video the feet skid, and the resulting bumpier gait requires too much power for TrotBot to carry the 10 pound load. ​To make it easier to check TrotBot's foot-contact at each corner, use the below 12-leg simulator. The simulator with front+back legs is further down. ​A description of the algorithms, and how we used them to simulate linkages, is here.